PLEASE NOTE THAT WE’VE FILLED UP OUR TEAM AS OF 9 DECEMBER 2015 AND ARE NO LONGER ACCEPTING NEW LAUNCH TEAM MEMBERS. Would you like a free copy of my new book, The Mindfulness Edge? We’re giving away 200 copies to our special Launch Team. Below, you’ll find an overview of the book, and instructions on how you can receive a free copy and be part our Launch Team. 1) Help us spread the word the week of 29 February – 4 March, 2016 by sharing your unique link to our book launch promotion via social media and e-mail (click this link to see how it will work). You would skip right to Page 3 of the promotion and be considered to have purchased the book in the promotion, so you will be eligible for all of the $100s of rewards for referring friends without having to actually buy the book. 2) Sometime in March, 2016, we ask that you post an honest review of the book on Amazon, Barnes & Noble, and Goodreads. 3) If you apply and are accepted to be part of the “Advance Copy Team” on the form below (the link is in #4), we ask that you read the advance copy prior to 4 March, 2016 and post a review on Amazon, Barnes & Noble, and Goodreads the week 7-11 March, 2016. There is a simple practice that can improve nearly every component of leadership and personal excellence and it doesn’t require adding anything to your busy schedule. 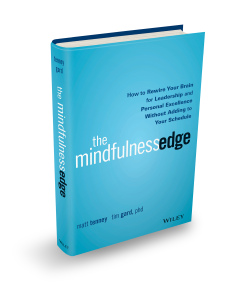 In The Mindfulness Edge, you’ll discover how a subtle inner shift, called mindfulness, can transform the things you already do every day into opportunities to change your brain in ways that improve both the “hard skills” and “soft skills” of leadership. A large body of research in neuroscience suggests that with mindfulness training, you can actually “rewire” your brain for leadership and personal excellence, while also becoming happier. Chris Thoen – Sr. VP, Global Head Flavour Science + Technology, Givaudan Flavours Corp. Yes, I’d like to be on the advance copy team too! Great! Did you indicate that on the sign up form? Id love to help and have a free copy! Great! Did you sign up on the form in the post?